Springvale Farm, a second-generation dairy farm established in the 1950s, is tucked away deep in the foothills of the White Mountains of New Hampshire. In 2008, Doug and Deb Erb built a creamery, allowing them to turn their milk into a value-added product (cheese) at a time when the viability of the dairy farm was particularly threatened. 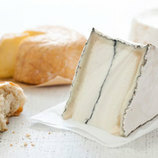 Knowing that the town of Landaff was established by a Welsh bishop, the Erbs decided to create a cheese native to Wales. After studying cheesemaking at nearby Vermont Institute of Artisan Cheese, Doug traveled to Somerset, England as a guest of the Duckett family to learn how to make Caerphilly, a favorite Welsh cheese. Back home, after much trial and error, Doug honed his skills and developed a similar cheese and called it Landaff. 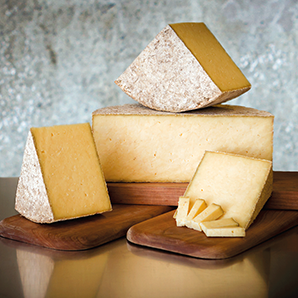 Aged at the Cellars at Jasper Hill, Landaff develops a beautiful grey rind and the distinct aroma of damp earth often associated with caves. The firm paste has a loose, open texture and a vibrant flavor profile reminiscent of yogurt.